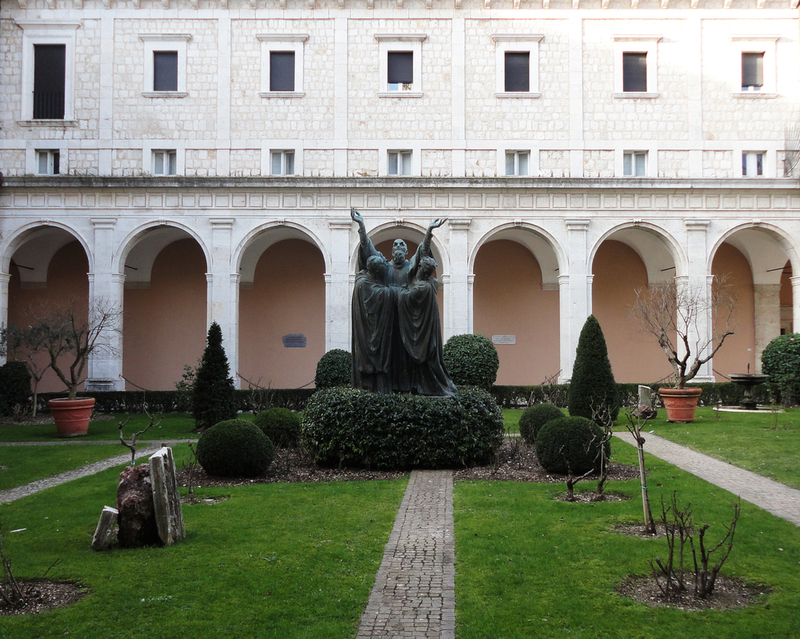 After founding twelve communities of monks at Subiaco, Italy, Benedict of Norcia (480 AD - 21 March 547) traveled to Montecassino where he established a monastery and wrote "The Rule." This simple set of guidelines for how the life of a monk should be lived has become one of the most influential works in all of Western Christendom. Saint Benedict was born at Norcia around 480 AD. That historical time frame, a mere four years before the Western Roman Empire formally fell by the deposition of the last Emperor, Romulus Augustulus, was quite difficult. The only authentic life of Saint Benedict is that which is contained in the second book of the Pope Saint Gregory’s Dialogues, probably written between 593-594 AD. After attending primary schools in Norcia, Benedict went to Rome to broaden his knowledge of literature and law. However, since he was probably disgusted by the dissolute lifestyle of his peers and by Rome’s difficult political situation, he retired to Affile with a group of priests, taking his old nurse with him as a servant. At Affile, Saint Benedict worked his first miracle, restoring to perfect condition an earthenware wheat sifter which his man-servant had accidentally broken. The notoriety which this miracle brought drove Benedict to withdraw further from social life. He took shelter in a cave in the ruins of Nero’s village, near Subiaco, where he began to live as a hermit. Immersed in loneliness, his only contact with the outside world was with a monk called Romanus, whose monastery was nearby. He gave Saint Benedict a monk’s habit and provided for his spiritual and material needs. Three solitary years followed. Some shepherds befriended Benedict. They began to follow his teachings and the pastoral and apostolic principles of the Benedictine Order took root. After resisting a strong temptation against chastity, Benedict prepared to live through a new experience, following the example of the ancient Fathers of Christian Monasticism. At first, the community of Vicovaro wanted him as its Abbot, but the failed attempt of a monk to poison him forced Benedict to return to his solitude. Afterwards, he founded twelve monasteries and assigned twelve monks to each of them. In addition, he founded a thirteenth monastery for novices and those needing education. Benedict’s fame spread so rapidly, even in Rome, that two illustrious men, Equizius and the nobleman Tertullus, entrusted him with their two sons, Maurus and Placidus. They were to become the first two gems of the Benedictine family. 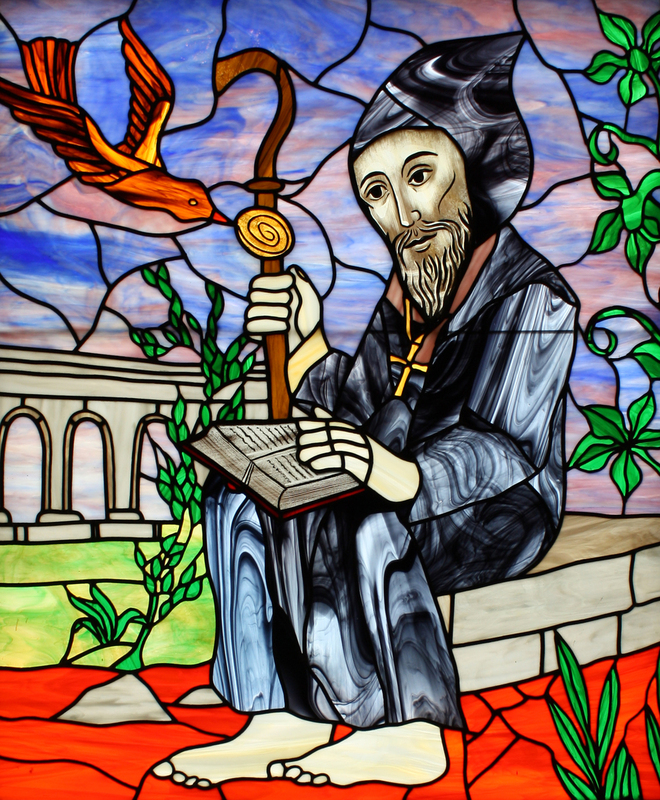 During his life, Saint Benedict performed many miracles. He found water on a desolate mountaintop to quench the thirst of his monks. He retrieved a bill hook’s iron from the bottom of a lake and rejoined its handle. He prevented a monk from leading a dissolute life through intervention. In addition, he made Maurus walk on water to save the young Placidus from drowning. Unfortunately, a priest called Florentius was envious of Benedict’s popularity and his envy forced the Saint to depart in spite of insistence from his disciples. After leaving Subiaco, Benedict went towards Cassino. In the period between 525 and 529 AD he founded the Abbey of Montecassino. It would become the most famous abbey in continental Europe. Under Benedict’s direction, the old acropolis-sanctuary towering above the declined Roman municipium of Casinum was turned into a monastery that was much bigger than those built at Subiaco. On the remains of the altar of Apollo he built a chapel dedicated to Saint John the Baptist, while the temple of Apollo itself was turned into an oratory for the monks which was dedicated to Saint Martin of Tours. At Montecassino Saint Benedict displayed prodigious activity. He supervised the building of the monastery, established a monastic order and performed many miracles. He brought back from death a youngster, miraculously supplied the monastery with flour and oil in its time of need and displayed the gift of prophecy. In autumn of 542 AD, while the Goth King Totila was passing through Cassino en route to Naples to attack it, he decided to test Saint Benedict because he had already heard of his gifts and charisms. As a consequence, Totila sent his squire dressed as a king to greet the monk; but Saint Benedict soon unmasked him. When he finally met Totila, he warned him with a dire prediction: “You have hurt many and you continue to do it, now stop behaving badly! You will enter Rome, you will cross the vast sea, you will reign for nine years; however in the tenth year, you will die.” And that is exactly what happened. Saint Benedict showed the same virtue as he cried bitterly when confronted wiht the vision of the first destruction of his monastery. Notwithstanding, he received from God the grace to save all the monks. Saint Benedict devoted himself to evangelizing the local population who practiced pagan worship. Shortly before he died, Saint Benedict saw the soul of his sister Saint Scholastica rising to heaven in the form of a dove. This vision happened a few days after their last talk together at the foot of Montecassino. In a vision, Benedict saw the soul of Bishop Germanus of Capua taken by angels in a fire globe. These visions, for Pope Saint Gregory the Great, showed a close union between Benedict and God, a union so intense that the Saint was given the share of an even more magnificent vision, the whole of creation as gathered in a sunbeam. In the end, a life so noble was justifiably followed by a much-glorified death. According to tradition, Saint Benedict died on March 21, 547 AD. He foresaw his coming death, informing his close and faraway disciples that the end was near. Six days before dying, he had the grave which he was to share with his deceased sister Saint Scholastica, opened. Then, completely exhausted, he asked to be taken into his oratory where, after taking his last Holy Communion, he died supported by his monks.